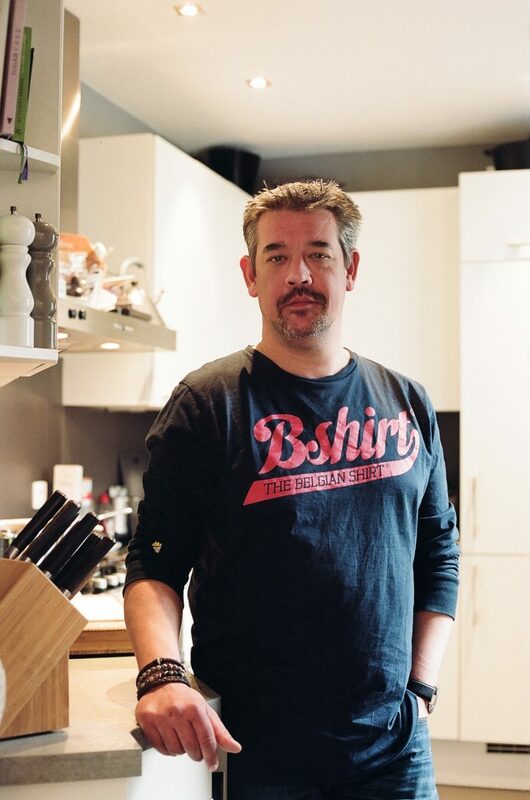 After working in a shoe shop and a record store, I fell for the world of cuisine in the early 2000s and worked as a manager for a famous French wine shop for almost 8 years. Later, the cooking school Mmmmh asked me to become the manager of their kitchen utensils store, and soon come, I started giving cooking classes to private groups and individuals, developing my passion for culinary animation and new recipes. Today I have the privilege to work both as a chef on demand and culinary consultant for Cook-it-up, and for Evreating alongside awarded dietitian Chloé Desmet. Self-taught and curious by nature, I have only ever counted on myself to develop my skills. However, I am not scared to ask people around me for advice if I can benefit from their experience. I like new challenges. I often have to work under pressure and I love it, but I remain rigorous to make sure my customers are happy. We are open to others and we draw our strength from multiculturalism. Dirk Frimout, because I am a soft dreamer and Dirk was lucky enough to have his head up in the sky. Jacques Brel, because through his songs, he has managed to express Belgium’s most beautiful things, but also the ugly ones. Stromae because he’s just “Formidable”. Christophe Hardiquest’s restaurant Bon-Bon. This chef, who is so simple as a person, fascinates me with his sophisticated kitchen, giving a special place to our beautiful local products. I would take them on a boat trip on Canal du Centre and in its surroundings to remind them that Belgium has a history of immigration that contributed to the development of our country. The first thing that struck me was Sylvain’s smile and good mood. I met him at Mmmmh in order to integrate his mayonnaise and ketchup into our delicatessen. Today, all the BK sauces are in my fridge. Belgium is a joke; it makes me laugh every day. Because they are humble and proud at the same time; complicated but simple. They are simply unique.